The suicide of old college friend Alex reunites a group of thirty-something professionals, former '60s revolutionary wannabes who tuned in, turned on, and then sold out. 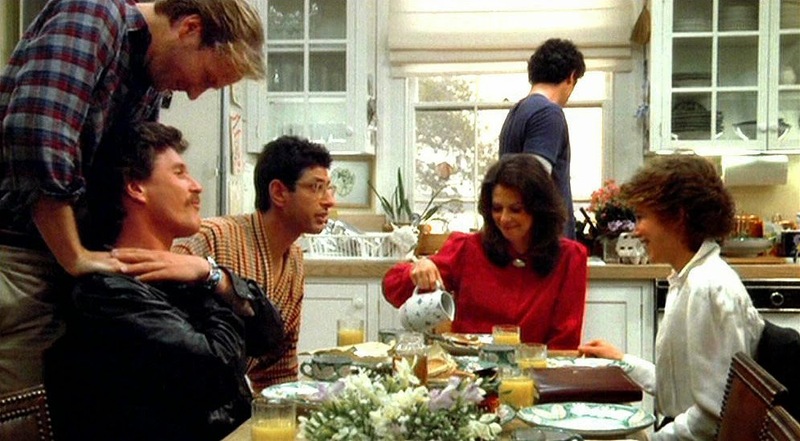 Lawrence Kasdan's “The Big Chill” (1983) is nothing if not unsubtle, providing each of the now solidly bourgeois adults time to bemoan the loss of youthful idealism as the pack spends the weekend after the funeral together to reminisce. All of them save for drug-dealing Vietnam vet Nick (William Hurt) are now among the elite, but worry that they've paid too high a price for success. Meg (Mary Kay Place) the lawyer was shocked to find out her clients were “scum”; Michael (Jeff Goldblum) cashes a nice check writing for “People” magazine but has to pander to subscribers who only read on the toilet; Sam (Tom Berenger) is an actor with his own weekly TV show but none of the self-esteem one might expect to accompany fame. Dr. Sarah (Glenn Close) appears the most content but still wonders what might have been. Alex, so it seems, is the only one who didn't knuckle under to societal expectations and look what it got him. He reminds me of the doomed protagonist of Louis Malle's “The Fire Within” whose unfulfilled hope was for things to “stay still around me.” Staying the same is a curse when everyone you know changes; things don't turn out very well for Malle's hero either. The takeaway from both films, emphasized more prominently in “The Big Chill,” is that conformity is the safest solution. It doesn't guarantee happiness, but it's essential to survival and that's all you're genetically coded for anyway. Nick the hold-out will “learn his lesson” over the course of the long weekend and settle down with a good woman and a constructive project, and if we're supposed to feel good about that development all I can think is that I wish this movie was told from Alex's perspective instead. I might have liked him. I'm now several years older than the Baby Boomer protagonists of the movie yet they seem incredibly old and quite alien to me, so complacently assimilated they can air their self-recriminations for a few days in a safe space then happily go back to enjoying success and being productive members of society, which is what really matters. Sure, suicide is sad, but why not squeeze some lemonade out of it by repurposing tragedy as a gigantic group hug? Michael might even get a good article out of it. You've got to take advantage of your opportunities. These are many of the best rock tracks ever recorded, most of which are among my all-time favorites, but wallpapering the movie (some songs are played nearly in their entirety) with K-Tel's Greatest Hits of the Decade is the audio equivalent of lazy contemporary filmmakers who signify the '60s with the obligatory montage of Martin Luther King Jr.'s “I Have A Dream” speech, hippies dancing, and aerial footage of a Vietnam jungle being napalmed. These are the songs you've heard 10,000 times now all together so you can make it 10,001! The overly familiar musical accompaniment undermines any sense that the friends are engaging in any serious self-examinations, settling instead for a heavily-processed nostalgia of the most generic possible kind. The film's real heart seems to be in the upbeat but vapid scene where they all dance to Gaye's “Ain't Too Proud To Beg” while cleaning up leftovers in the kitchen. Mary Poppins would be proud. There's an undeniable appeal to a long weekend with old friends during which you can instantly tap into a decades-old non-judgmental camaraderie, but deep it ain't. This is more the hippie “Hangover” than a generational commentary or a comment on much of anything at all, save the implicit recommendation that everyone just get with the program and save themselves a lot of grief in the struggle. The film is presented in its original 1.85:1 aspect ratio. This newly-restored 4K digital transfer offers sharp image detail and rich colors as you would expect from a Criterion high-definition release. Not a lot to say here. I'm sure nobody will have any complaints. This is a dual-format release with two DVDs and a single Blu-ray. The DVD transfer has not been reviewed here. The default option is the original mono track (in LPCM) but Criterion has also included a DTS-HD Master Audio 5.1 surround option. I say always stick with the original, but the surround is a nice option. Dialogue is clearly mixed and the music, the main sound attraction here, sounds rich and resonant. For you sticklers, Criterion indicates that “For the alternate 5.1 surround presentation, stereo music masters were used in tandem with elements from the 3-track dialogue, music, and effects stems.” Optional English subtitles support the English audio. Perhaps in keeping with the spirit of the film, none of the extras here are particularly deep, but Criterion has dug up about two hours of material. The best is a short interview with director and co-writer Lawrence Kasdan (2014, 12 min.) who talks about the challenges of doing meaningful, personal work within the Hollywood studio system. Appropriately, the two longest features are all about nostalgia. 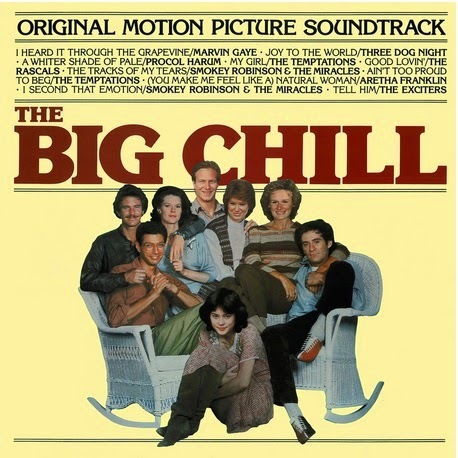 “The Big Chill: A Reunion” (1998, 56 min.) is directed by Laurent Bouzereau. Released for the 15th anniversary of the film, it consists mostly of interviews with cast and crew. The other feature is a recording of the 30th Anniversary Reunion which occurred on stage at the 2013 Toronto International Film Festival. Critic Scott Foundas moderates with Kasdan and most of the cast members reminiscing for 44 minutes. 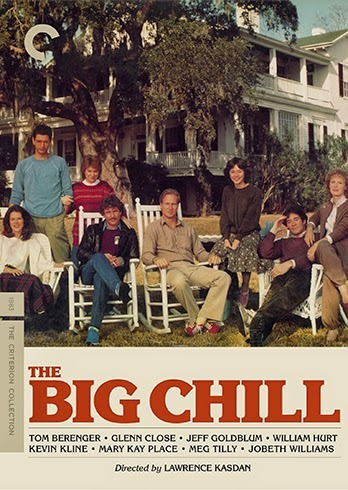 “The Big Chill” seems like an odd choice for a Criterion release, but I guess you can put it on the shelf next to “Armageddon.” The transfer's good, at least.